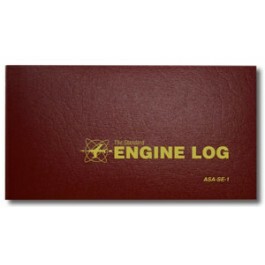 Soft cover ASA-SE-1 Standard Engine log. Simplify recordkeeping and ensure compliance with the regulations. This logbook lets you keep track of engine inspections, tests, repairs and alterations, airworthiness directives, manufacturers' mandatory service bulletins, and equipment removal or exchange. Burgundy, 7-1/4" x 4", 62 pages.